There were also plenty of cruisers who had no idea that good-time Gronkowski was among them. The Norwegian Pearl holds more than 2,300 passengers, but only 700 of them were part of Gronk’s cruise. The rest thought they were on the boat for an ordinary vacation to the Bahamas. Non-Gronk fans interviewed said they were unfazed by the shenanigans; in fact, some of them enjoyed the additional color. 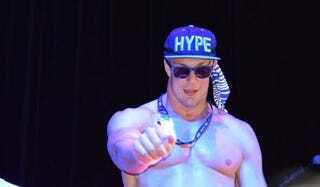 Anyway, please enjoy some sights and sounds of the Gronk cruise.